Seriously. Stop hating on Pinotage. Why? Because there’s nothing “wrong” with it. I am here today to tell you that Pinotage is not bad; it is simply different. And if you don’t like this oft-maligned but more-oft-misunderstood South African cross between Pinot noir and Cinsaut, that’s your prerogative. Just stop drinking it and shut about it, already, then. I mean, Pinotage has some high-profile wine critics who are haters right now – for Pete’s sake, Lettie Teague expresses disdain for it on her friggin’ homepage. Yes, the worst of them (Pinotages, I mean, not wine critics) smell too much like overly-aged smoked meat wrapped in bananas and dipped into a vat of acetone that’s being bioled over a tire fire. I fully acknowledge that, okay? But riddle me this, Wine Man: what bargain-basement version of any variety doesn’t have its fair share of sh*tty-tasting bottlings? Ever had really bad Cab? Terrible Pinot? Of course you have. Pinotage is no different than any other fine wine grape (yes, I meant to put the “fine” part in there), in that bad fruit in incapable winemaking hands results in a terrible wine, overemphasizing the worst qualities of any grape. It just so happens that Pinotage has more ammunition with which to work than most in the off-odors department. That doesn’t mean that Pinotage cannot be beguiling when the right fruit gets into the right winemaking hands. It just means that there’s a little more of a deft balancing act to be attained when dealing with Pinotage. I suppose that I should expect a great deal of challenging push-back on this, since many seem to be strong with the Dark Side of the Pinotage Hate Force these days. So why the crotchety words on Pinotage-hate? Because I’m sick of wine variety bigotry, in which one style or grape gets maligned unfairly simply for being… itself.. The bottom line is that a lot of people dig the red fruit, leather, bacon, tropical fruit kitchen-sink mix of aromas that Pinotage has to offer – and they’re not wrong. You can shift your perspective to see their Pinotage-loving point of view, by the way – you just need to approach it with an open mind. Am I saying that you should happily gulp-down any old Pinotage that reeks of acetone? NO – pour that shiz down the drain where it belongs. But I am saying that Pinotage that is complex, interesting, even compelling and doesn’t reek of acetone is, in fact, totally worth seeking out because it may end up being one of the most eye-opening, unique wine experiences that you’ll ever have along your personal journey towards vinous enlightenment. The 2008 Kanonkop deftly captures the entire BBQ picnic in a single bottle; toast, smoked meats, red fruits, bananas, leather purses & all. In the grand scheme of things, it’s a great introduction to high-end Pinotage and actually delivers quality and complexity levels a bit above its price point. The interesting thing about this wine, for me, is that it’s also a bit of a crowd-pleaser. I’ve served it to people without telling them what it is, and most happily drink it up and actually perform a bit of a head-fake when I later tell them it’s Pinotage. Now, it definitely tastes like Pinotage, it’s just that it’s fruity enough that the smoked meat and tropics are part of a balanced whole, so they don’t dominate. If I have a cavil about this juice, it’s that it’s a bit oaky – but even that demonstrates a fairly unique quality that Pinotage possesses, which is an ability to absorb amounts of toasty oak that would cripple other varieties and yet still offer a balanced and pleasing drinking experience. So is this a commercial for Pinotage, harkening it as my new fave fine wine variety? No. But it is a minor plea against the undeserved hate. As always great reading your blog. Tampa – HA! I LOVE that tasting note!!! Cheers! about $136 abroad…if that’s not premium and worthy to be in any winesnob’s cellar, then what is? It’s proudly South African and seeing we’re the world’s scapegoat, they expand their hate onto our wines. Haters gonna hate,but we’ll still drink Pinotage! Thanks, Erich! Need to get my hands on that wine! Kudos for supporting Pinotage! I am been a big fan for years and just don't understand all the hate it gets. Seems sometimes almost fashionable to diss Pinotage, but it is no more deserving of the hate than any other grape. I also give Pintoage a 'thumbs up'. Unfortunately Pinotage in New Zealand suffers from same stigma, largely ignored by writers in the mainstream press and wine retailers not wanting to stock because they have to 'hand sell' , but some fantastic wines are being made. Most notably Kidnapper Clffs, Karikari Estate, Muddy Water and Kerr Farm. Thanks, Sue. NZ Pinotage? Man this stuff is grown everywhere :). I know of at least one Sonoma Coast producer who grows and vinifies it as well. Cheers! I applaud your pension for sticking up for the Pinotage, although I must say I have not had too much experience with the varietal myself. I get frustrated when critics, movies or the wine "elitists" pooh-pooh a varietal just because they feel it does not have the long running pedigree that other varietals might have. That is like throwing out the whole bathroom with the bathwater, let alone the poor baby! I don't know if Merlot will ever recover from Sideways, and I am not sure the Syrah market will recover in the US of A anytime soon (although as far as I can tell that is for different reasons). At any rate, keep sticking up for the underrated/underappreciated varietals and we will keep reading! I have visit South Africa twice and always bring back at least 10 bottles of Pinotage (also declare them). A great wine. They have been a cross section of Piontage from fruity to intense. Also have great attributes. It reminds me sort of Norton here in the US. A differnt type of wine. Not all people like it but truely an American wine with great potential. Great comparison to Norton ( another unfairly maligned variety! ). Cheers! I am proud to say I work for a fabulous winery called The View in Kelowna, BC. Our primary red is Pinotage (actually we are the largest grower in BC!) It grows exceptionally well in our soils here in the Okanagan, and I have had many of our guests say it give them the warm and fuzzies of being back in South Africa. We are very excited to help give that fabulous little grape the recognition it deserves, and it is being poured at a number of high-end restaurants here in town. We are trying to keep up with the demand! So to all the fancy-pants out there that turn their nose to this great grape…thank you, because it leaves more for us! Pinotage in BC? That’s pretty friggin’ cool! "overly-aged smoked meat wrapped in bananas and dipped into a vat of acetone that’s being bioled over a tire fire" — I love this! I'm not sure I will really ever get when a wine is "unctuous," which is why I love your notes — totally unpretentious and vivid. As for Pinotage — I had one at a restaurant recently (the waitress recommended it) and while it did not have the bad characteristics you listed, it was just sort of boring. Short finish. Concentrated, but not very interesting fruit. At a good price, I have had Kanonkop's Kadette — a red blend that included Pinotage — several times and really liked that. Thanks, Michael; I try :). Agreed on the Kadette! Cheers! On my recent trip to South Africa, I learned that there's a very popular joke among winemakers there: "There isn't enough room for three types of people in this world: murderers, rapists, and people who like Pinotage." As you might guess, the joke goes over really well with about half of all winemakers… and infuriates the other half. Thanks, Laura – wild and sassy are perfect descriptors for Pinotage! Halleluja to you! 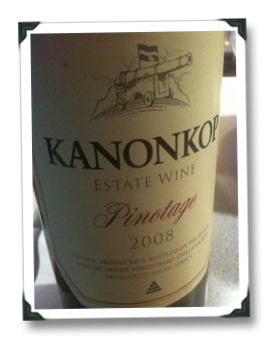 Pinotage also ages very well, when made properly – I recently drank a 1976 Kanonkop Pinotage that was still beautiful. There has been a trend the last couple of years to make lighter/medium bodied style of Pinotage. This seems to bring out the Pinot Noir parentage of the cultivar more. "Because I’m sick of wine variety bigotry, in which one style or grape gets maligned unfairly simply for being… itself.."
Sooo true. I face this a lot with hybrid varieties. Some of them are really, really pleasant and have a firm stance in our wine market. It's just that, they are still young and winemakers are learning the ropes on how to embrace these varieties for what they are. I've tasted fabulous, medium-bodied Chambourcins and Noirets, that I believe deserve some credit! And the success of white varieties like Traminette and Vidal Blanc are successful for a region. Wine bigotry… haha… I liked that! Thanks for supporting Pinotage! Thanks, Denise! Vidal is a particularly pertinent example, especially when it comes to Canadian ice wine. Cheers! Nice article! Joe it right on in pointing out the bigotry and elitist attitude of many wine critics. It's about time people saw that quality in South Africa is not reserved to Chenin Blanc alone! Thanks, Anthony. I love me some Steen as well! What a wonderful dialogue, about a grape we almost did not plant when we acquired, replanted, and tripled the vineyard in size: http://www.silkbush.com. Our mountain setting has had great results with 11 different cultivars, but the Pinotage is exceptional. Bruce Jack/Flagstone has been ABSA Top 10 winner twice with exclusively our fruit, and now we are importing it to the US under the Lions Drift brand. As growers in Napa and Sonoma of 700 acres for 38 years, we had a fair amount of experience with wine grapes before we started our adventure in the Cape. But for the first five years of visits, we tasted a fair amount of mediocre or worse Pinotage. When grown improperly or on the wrong terroir, the results are a disaster. Accordingly, much of the negative commentary about the grape over the years is deserved, but don't write off Pinotage. When it is good, it is VERY, VERY GOOD. Great to read some REALISTIC wine commentary here – it should be individual wines which are criticised and/or praised, not varieties! 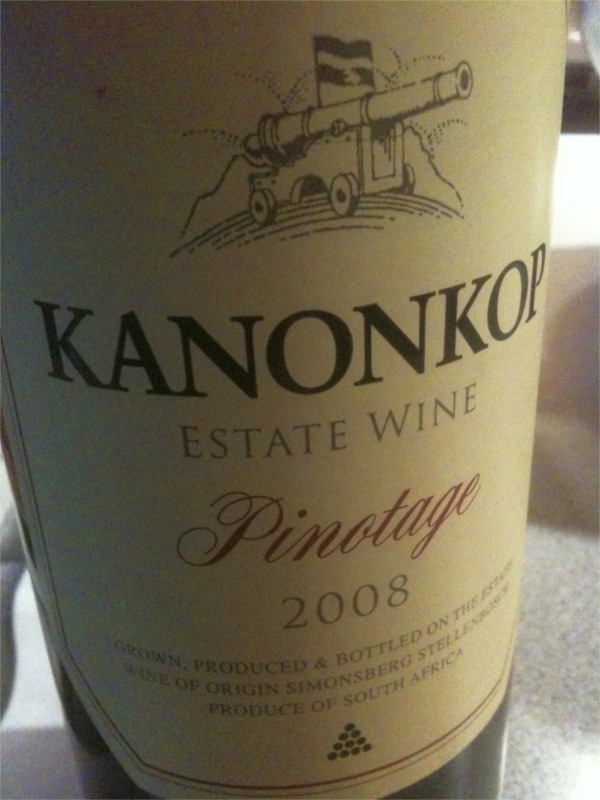 BTW, that 2008 Kanonkop is a stunning example of wonderful Pinotage – it's unfortunately still just FAR too young! In a few years, it will convert most sceptics – possibly even Robert! I first drank Pinotage In 2005 in the Tulbagh region of South Africa. Talk about funky. It tasted like feet smell. Over the course of my stay I tried several others and didn't like them either. I moved up the food chain and sprang about 40 USD on a bottle and cradled it all the way back home. One night we cooked up a special dinner and I pulled out that special bottle of Pinotage. Yuck. Same nasty taste and smell. Well, I went back to SA last March and wow has the quality changed. I was lucky enough to get to sample several Pinotage wines in a wine shop in Cape Town. Some were better than others just like with any other wine varietal but none tasted God awful like previously. The winemakers today have really done a great job of improving the quality of these wines and they are certainly worthy of another try. You're right, it's a different tasting wine but one I'd gladly add it to my everyday wine cellar. Some people who make the biggest noise about 'hating' pinotage are those that have tried the fewest! If you liked the 2008 Kanonkop you must get the 2009 because it is superb and quite approachable young. Pinotage is interesting as it ages and it changes considerably in taste profile.. I was lucky enought to have a glass of 1984 Neethingshof Pinotage yesterday – offered blind, like a fine old claret plus that trademark sweet fruit. As others have said, there are some cracking Pinotages coming out of California, Canada and New Zealand, and South Africa of course, also commercially made in Virginia, Israel, Australia, and Brazil. Give me a fine Pinotage but please keep the Coffee Pinotage far away from me! Great article Joe, the first Pinotage I had was "Coffee Pinotage" a supposedly top seller in certain circles and it was one of the worse beverages I've ever tasted. Indescribable really. I do know of a well-made South African Pinotage I can have sent your way…I'll send ya an email. A friend and I once had a Pinotage in a shipment from Gary Vs wine club. As we tried it we were struck by the smell of old sweat socks, y'know. Strong, moldy, sweaty clothing. On it's own it tasted like Klingon Blood Wine, or what we thought that might taste like. However, as the day went on someone brought some spicy BBQ sausage. This is Texas so BBQ cam be complicated and powerful. The sausage turned out to be a perfect pairing for the Pinotage. Both of which were gone in short order. 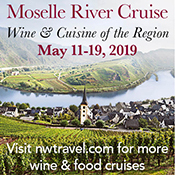 Trackback from Terroirist » Daily Wine News: Pay Attention!